We know that when you're working out, your goal is to be stopped on the treadmill mid-sprint because of how cool your leggings are...right? Okay, so that's not quite it. But an eye-catching pair of performance capris can really lift morale. Picture this: You're a half mile from home during a long run, and you're starting to fade. Then you look down, and Toast of Toast Meets World is looking right back at you. Zara Terez makes this happen, and Rank & Style vouches for it. The New York brand's selection of photo-real bottoms earned the top honor in Rank & Style's list of best printed leggings, partly due to their marriage of functionality and pop-culture relevance. 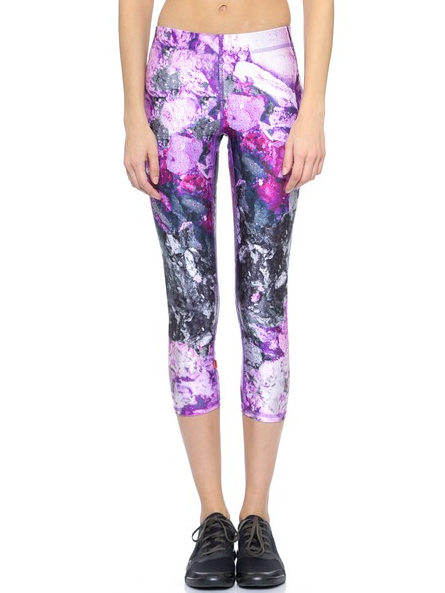 Toast isn't the only millennial favorite to get the leggings treatment: Zara Terez also makes emoji and kale prints. Understandably, these capris have garnered a lot of buzz from the Internet crowd (hello, tremendous Instagram potential) — and Rank & Style checks them off as an editor favorite. But they're not just for show: These performance leggings are made of a moisture-wicking fabric and have a covered elastic waistband for additional comfort. And they ring in at under $100. A statement piece like this shouldn't stand alone: Pair it with a sleek running top to round out the athletic #OOTD. If you're on a tighter budget, though, Rank & Style has put together a list of best leggings under $50. Throw it all in one of the best, Rank & Style-vetted yoga bags, and your fitness wardrobe is set.